Jane Mayer of the New Yorker wins the April Sidney for “The Making of the Fox News White House,” a meticulously reported feature that documents how Fox News became the propaganda arm and the policy shop for the Trump White House. Mayer shows how Fox News transitioned from a relatively independent conservative news outlet to the “sword and shield” of the Trump administration, the closest thing this country has to state TV. Mayer set out to understand whether Donald Trump controlled Fox News, or vice versa. Three months and 75 interviews later, Mayer concluded that the two are “seamlessly symbiotic,” with former Fox News exec Bill Shine acting as Trump’s then-deputy chief of staff and Trump in constant telephonic contact with the likes of Sean Hannity and Rupert Murdoch, when he’s not glued to “Fox & Friends.” Even foreign intelligence services have figured out that the best way to influence the president is to get on Fox News. Mayer details how Fox had the Stormy Daniels story before the election, but killed it to allegedly help Trump, and how Trump has intervened on key regulatory issues to benefit Fox. “Fox makes money, and solidifies its ratings by scaring its audience, and Trump intensifies the support of his political base with the same tactic, spreading fear – of immigrants, of socialism, of uppity minorities and women ostensibly threatening the American way of life, or of people who don’t say “Merry Christmas” – or of environmentalists who will take away hamburgers – you name it, Fox and Trump are together conjuring boogeymen on a daily basis to keep their supporters engaged,” Mayer explains in Hillman’s Backstory interview. Jane Mayer has been a staff writer at The New Yorker since 1995. The magazine’s chief Washington correspondent, she covers politics, culture, and national security. She is the author of four best-selling books, including “Dark Money: The Hidden History of the Billionaires Behind the Rise of the Radical Right,” which the New York Times named as one of the ten best books of 2016, and which began as a 2010 New Yorker piece about the Koch brothers’ deep influence on American politics. She received a Hillman Prize for her book, The Dark Side,” in 2009. Q: You interviewed a political scientist who said that Fox News is the closest thing we have to state TV in the U.S., what did she mean by that? A: What Nicole Hemmer, an historian at the University of Virginia meant when she told me that, was that Fox is playing an extraordinary and unprecedented role in our country, which is to be as close to an arm of the White House as any news organization in our history. The press in this country is supposed to be independent, and hopefully a check on the powerful, but instead Fox has become as I wrote, both “a shield and sword” that Trump uses to amplify his power. Q: You set out to map the complex web of influence between Fox News and the Trump White House. What was your investigative strategy for understanding the relationships between them. A: This story took months of reporting and involved interviewing more than 75 people. One of the most important strategies was to find sources who would speak, hopefully on the record, whose credibility was beyond question, which meant finding surprising voices to speak out, who were not the usual liberal critics. Part of the reason the story struck a nerve I suspect is that it’s filled with powerful quotes from conservatives who have become appalled by the propagandistic direction in which Fox has gone since Trump’s election. Q: Shortly before he was ousted as CEO, Roger Ailes predicted that if Rupert Murdoch got too close to Donald Trump, Trump would end up controlling Fox News. Trump and Murdoch are now very close. Has Ailes’ prediction come true? Does Donald Trump control Fox News? A. One of the mysteries that I set out to solve was who really calls the tunes at Fox News on any given day or topic - is it Fox, or Trump? The answer turned out to be that they are almost seamlessly symbiotic. They have the same business model so they echo and amplify each other all day. Behind the partnership is mutual self-interest. Fox makes money, and solidifies its ratings by scaring its audience, and Trump intensifies the support of his political base with the same tactic, spreading fear – of immigrants, of socialism, of uppity minorities and women ostensibly threatening the American way of life, or of people who don’t say “Merry Christmas” – or of environmentalists who will take away hamburgers – you name it, Fox and Trump are together conjuring boogeymen on a daily basis to keep their supporters engaged. Q: Trump’s influence on Fox predates his presidency. In 2011, Trump started promoting the “birther” conspiracy theory as a regular guest on Fox News, whereupon prominent Fox hosts switched from ridiculing birtherism to indulging it. Do you think the hosts were taking their cues from Trump on birtherism, and if so, why do you think they decided to imitate him? A. It’s hard not to conclude that Trump showed Fox’s hosts that there was ratings gold to be gained by spreading something they knew was a racist falsehood, the lies that Obama wasn’t legitimately born in America. Trump’s shamelessness seems to have inspired Fox to abandon whatever standards had held the hosts off before Trump got on the air. Q: Rupert Murdoch’s business genius was to create a new TV audience united by fear, anger, and racism, instead of competing for a slice of the existing centrist audience. Is it fair to say that he laid the ideological groundwork for a candidate like Trump to become president? A. Reed Hundt, the former Chairman of the FCC, told me that, in essence, Murdoch saw the Trump base before Trump did. Murdoch geared programming to that segment of the population, and then Trump came along, and mobilized it behind his candidacy. Q: In the piece, you differentiate between Fox News’ journalism and its opinion programing. But Fox allegedly killed a major straight news story about Stormy Daniels to help Trump win the election. If Fox is willing to engage in coverups on the news side to help Trump politically, can it still be considered a journalistic organization? A. Many of the people I interviewed pointed out that there are a few good journalists who work on the ‘news’ side, as opposed to the ‘opinion’ shows at Fox, but while there are exceptional moments when an on-air reporter will criticize Trump, these are the exceptions to the rule. There are journalists who work at Fox, but they are all but overwhelmed by the political agenda of the company. Q: Can we have a healthy democracy when the president communicates through his own propaganda network while freezing out competing news organizations? A. Democracy requires well-informed citizens, and to the extent that Fox is pumping propaganda and disinformation out to its national audience 24-hours a day, while denouncing legitimate news outlets as fake, it is undermining the health of our political discourse. I’m all for political debate and a wide diversity of viewpoints. But as the late Senator Daniel Moynihan said, everyone’s entitled to their own opinions, but they’re not entitled to their own facts, yet Fox is blurring that distinction almost every day. Q: What impact did your story have at Fox News and beyond? A. The New Yorker story seemed like a gunshot that triggered an avalanche. The conditions were there, and not of my making, before the story came out, but it set off an amazing series of events, Shortly after the story was published, Trump fired his White House Communications Director, Bill Shine, whose controversial ties to Fox I highlighted – Shine was the former co-president of Fox News and while in the White House, remained in constant communication with his close friend, Sean Hannity, Fox’s most popular host, and Trump’s biggest on-air booster. Democrats in Congress immediately began investigating whether Trump had pressured the Justice Department to favor Fox by trying to block a merger of its rivals, AT&T and Time Warner. The story revealed that Trump ordered his former economic adviser, Gary Cohen, to stop the deal by pressuring the Justice Department to file suit against it, which it did. Separately, Democrats in Congress also launched an investigation into whether Fox executives killed the story before the 2016 election that Trump had paid hush money to silence a pornographic film star from saying she had had an affair with him, which could be seen as not only potentially journalistically corrupt, but also an undisclosed gift to his campaign. Additionally, The Chairman of the Democratic Committee, Tom Perez, announced that the DNC would not allow Fox to host any of the Democratic presidential debates, because the New Yorker story revealed that Fox was for all intents and purposes, an arm of the Trump White House. 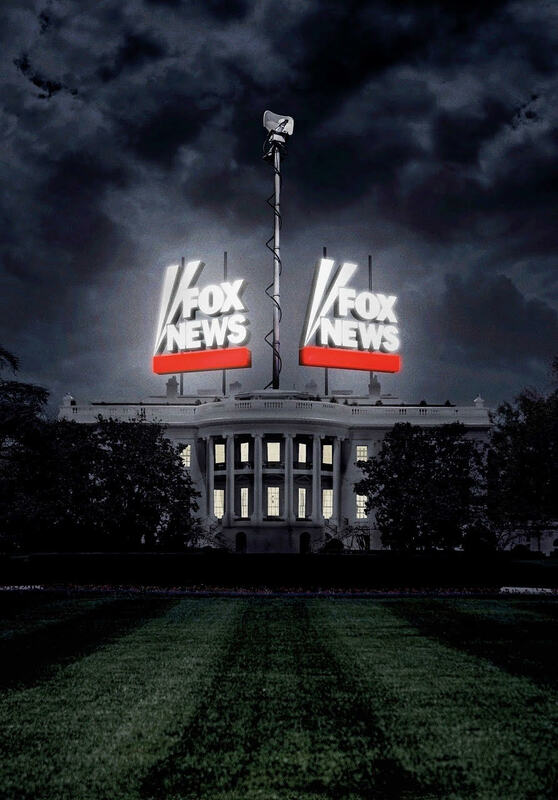 And Fox itself was beset by protests and further scandalous revelations including previously undisclosed grotesquely sexist comments made by its prime time host Tucker Carlson, and an on-air anti-Muslim comment by another host, Jeanine Pirro, whom Fox suspended as a result.